The humble backsplash has come a long way. Once upon a time, its purpose was purely functional: a tiled area behind the stove and sink to protect kitchen walls from stains and splashes. Today the availability of all manner of materials in a wide array of finishes means your backsplash can make more of a statement. 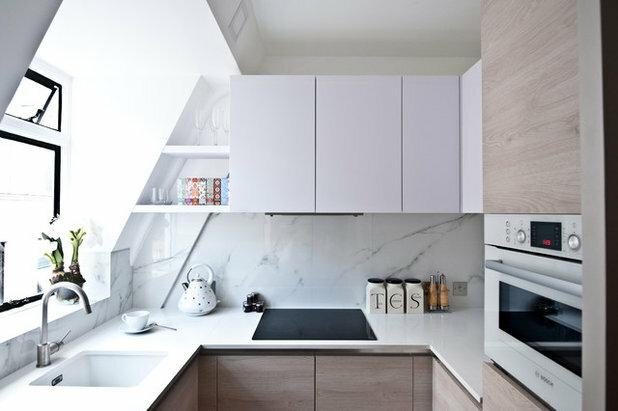 To help you decide which material would work best for you, we offer expert advice on the 10 most popular backsplash materials. 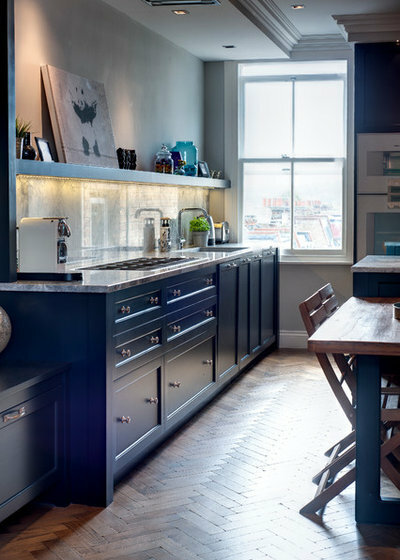 Get an industrial vibe with a stainless steel backsplash. The material comes in sheets of flat steel that can be fixed directly to the wall with either glue or screws. Pros: Stainless steel is not only affordable; it’s known for its heat-resistant and hard-wearing properties. It’s also easy to clean. Cons: Although easy to clean, stainless steel can be difficult to keep looking pristine. It is not scratch resistant — although minor scratches enhance the look over time — and can dent. 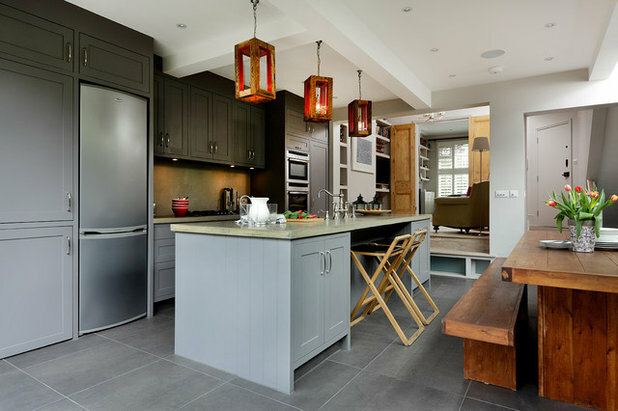 Tiled backsplashes are a popular choice, as they offer versatility, practicality and style. Thanks to advances in printing technology, ceramic and porcelain tiles can be produced to resemble natural wood and stone, but with none of the associated performance challenges. The tiles are resistant to scratches, heat and water, and should be reasonably cheap and easy to install. And while they are durable, should a tile become chipped or damaged, you simply need to remove it and lay another. Pros: While tiles are easier to clean than most other materials, and therefore lend themselves perfectly to a backsplash, this is not the only reason they are ideal for the job. “With such a range of shapes, sizes, colors and patterns now available, tiles give you the freedom to put your own creative stamp on your room without compromising on practicality,” says Robin Auld of Topps Tiles. 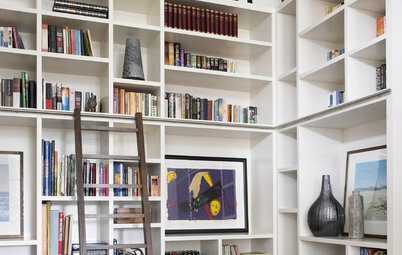 Cons: The sheer volume of styles and finishes can be overwhelming. “Consider exactly how the space will be used to ensure your choice works with your lifestyle,” Auld says. 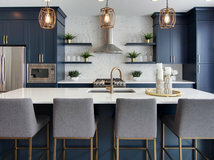 “While pristine white tiles and matching grout may look perfect in a modern, low-use kitchen, they are not the most practical choice for a busy family space.” Darker-colored grouts are definitely worth investigating. Pros: Strong and durable, glass is also easy to clean and install, being either screwed or glued to the wall. 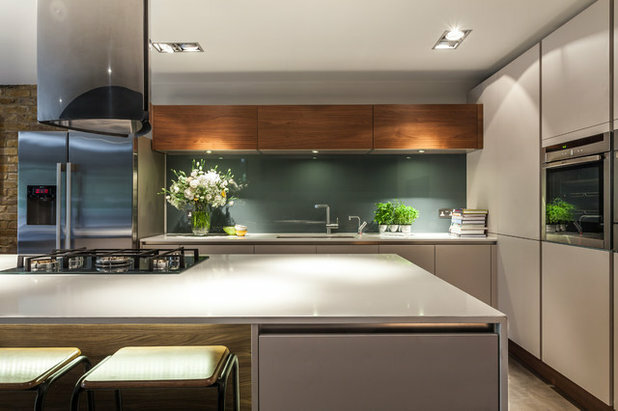 While glass backsplashes used to be expensive, the good news is that prices have decreased dramatically in recent years. 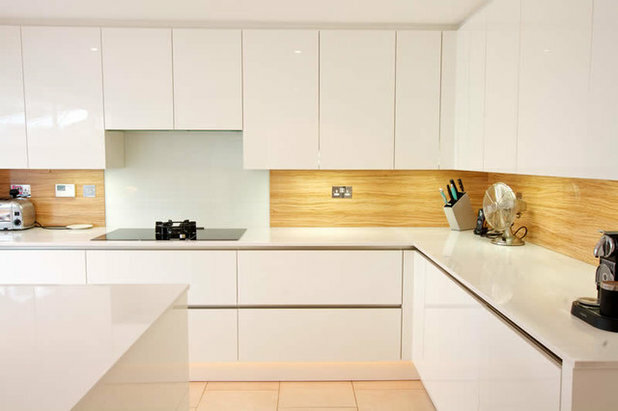 Also referred to as quartz composite, engineered stone is made of crushed quartz mixed with resin. 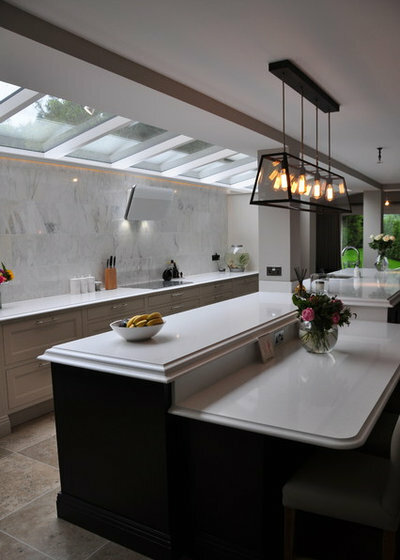 “Look out for leading brands, such as Silestone and Caesarstone, that make their engineered stone using the lowest percentage of resin,” advises Andrew Macintosh of Andrew Macintosh Kitchens. High-performing engineered stones are heat and scratch resistant as well as extremely tough. 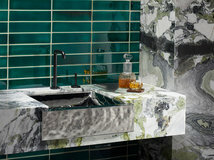 To keep costs under control, Macintosh suggests teaming an engineered stone backsplash with matching countertops. “If you do this, the templating and fitting charges are much lower than using a different material and supplier,” he says. Pros: Engineered stone is durable, scratch resistant and nonporous, meaning it won’t stain. 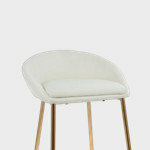 It’s easily cleaned with warm, soapy water and comes in a wide range of different colors to suit all tastes. 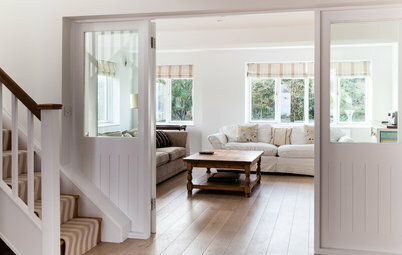 It’s supplied in large panels, resulting in fewer or no seams on a larger wall run. Cons: Installation of an engineered stone backsplash must be done by a specialist. “It is certainly not a DIY job,” Macintosh says. 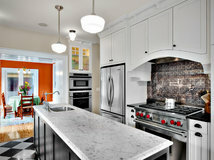 Granite is still a favorite for backsplashes, working equally well in traditional and contemporary settings. What’s more, no two slabs of natural stone will ever look exactly the same, so you are guaranteed a unique look. If you choose honed granite, test some samples with water and oil, as certain variations of the stone can show wet marks longer. Pros: Granite is easy to clean, very hard wearing and available in a range of different colors. Cons: Among the costlier backsplash options, granite is porous, so it needs sealing to prevent staining. Pros: It’s easy to maintain and needs minimal care once installed — simply wipe it down. Cons: Although polished plaster is fairly hard wearing, accidental chips cannot be repaired. 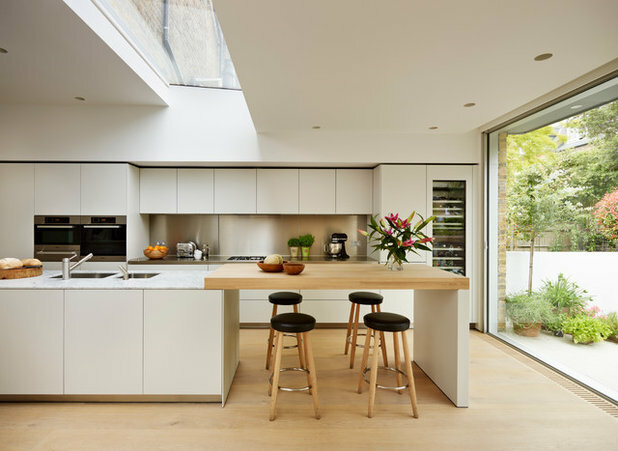 “If this is a concern, use your worktop material to create an upstand — a small skirting around the edge of the worktop — to help protect the plaster,” Borthwick says. Composite (or solid-surface) materials, such as Corian and Hi-Macs, are usually made from a blend of one-third resin and two-thirds natural mineral. Available in a diverse color range, they also offer extraordinary design flexibility and can be seamlessly molded into angles and curves, so there’s no seam between the countertop and backsplash. This makes them easy to keep clean and hygienic, because there are no seams where dirt can gather. Pros: Composites are nonporous, easy to care for, hygienic and durable. 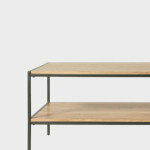 Joints are inconspicuous, providing a seamless surface. Cons: Composite materials such as Corian can be scratched, but very often scratches can be sanded out. Also, “Corian is not heat resistant, so you can’t install it behind a gas [cooktop],” Hendrick says. If your budget won’t stretch to a natural stone backsplash, consider laminate. 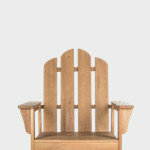 It is not only affordable, but it comes in numerous colors and finishes designed to look like real wood or stone. Although laminates don’t offer the same sense of luxury, high-definition printing and textural innovation mean they can look and feel increasingly realistic. 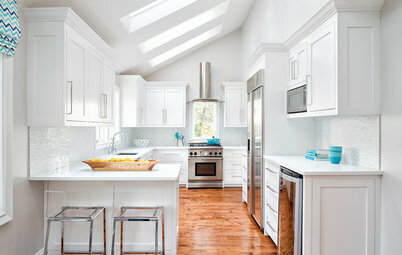 Pros: Easy to keep clean and water resistant, laminate is a hard-wearing and affordable choice for a kitchen backsplash. 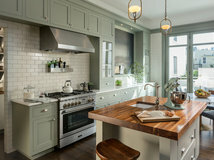 “Match it to other finishes in your kitchen so it becomes part of the whole color scheme rather than just a statement feature,” says Diane Berry of Diane Berry Kitchens. Cons: Laminate is not suitable for use behind a gas range because of the open flames, and Berry also recommends a gap of at least 4 inches (10 centimeters) between a laminate backsplash and any other kind of stove. 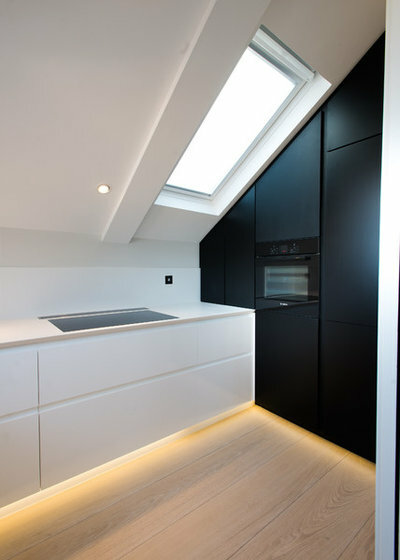 “You also need to make sure it’s installed well, particularly around wet areas, to stop water soaking into any joints, just as you would a laminate worktop,” she says. 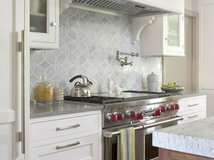 A mirrored glass backsplash suits all styles of kitchen, often adding a contemporary twist to a more traditional look. Its reflective surface bounces light around, making the space feel bright and often larger than it really is. 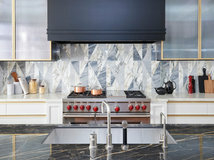 “If you want mirrored backsplash in your kitchen, then general safety regulations dictate that you must have toughened or tempered glass,” Hendrick says. 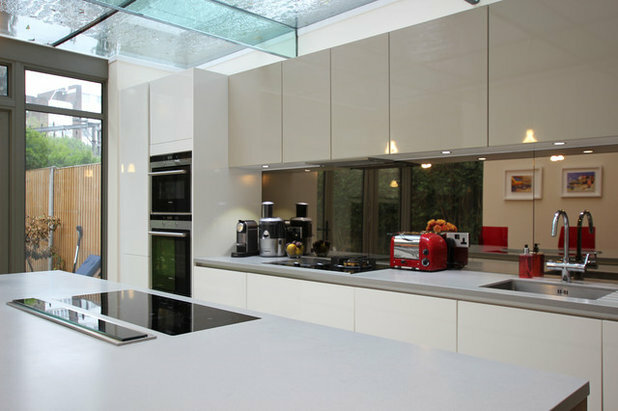 Pros: Toughened so it’s strong and durable, mirrored glass is also easy to clean. 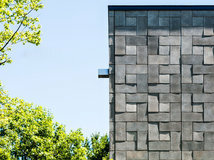 And because panels are available in lengths up to around 10 feet (3 meters), it’s possible to create a seamless look. Cons: Mirror can’t be used behind a gas range, because continuous expansion and contraction of tempered glass created by an open flame can, over time, cause visible cracks to form behind the glass, Hendrick says. “Although easy to clean, mirrored glass needs a regular polish, because marks show up easily,” he adds. 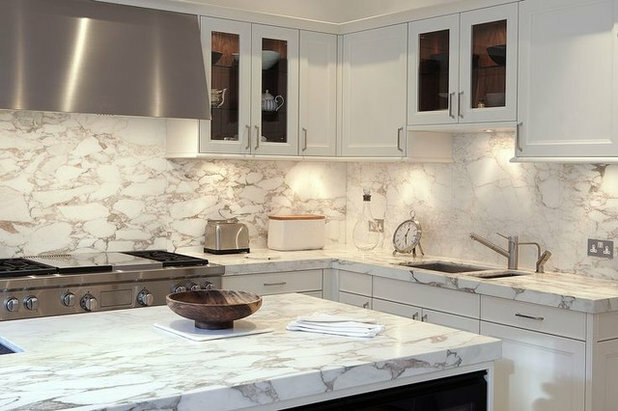 Nothing beats the natural beauty of a marble backsplash, which never fails to bring a luxurious look to a kitchen. It’s important to be aware, however, that marble is porous, so it needs sealing and periodic resealing to prevent staining. It also gets scratched more easily than other materials. Tell us: Do you have experience with any of these materials, and which would you recommend? Share your thoughts and photos in the Comments. I love your choice of #2. The other is too plain and the detail is too tiny. Love the glass, it's beautiful. Go with what you want, it's your bathroom. 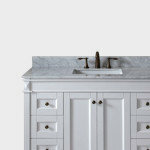 I have a white Carrara quartz splashback and worktops. 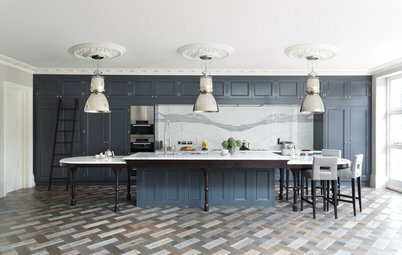 I’m planning the floor covering and have come across matching marble tiles (80x80). 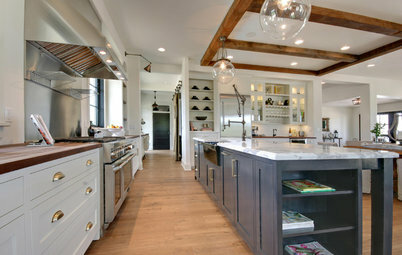 Do you think it will complement the kitchen or be too much of the same? 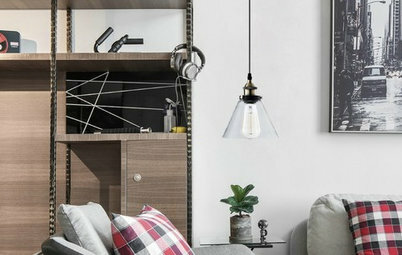 Decluttering Ask an Expert: What Is Your Ultimate Space-Saving Trick? 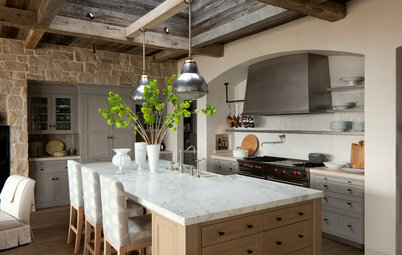 Houzz Quiz Houzz Quiz: What Kitchen Countertop Is Right For You?